It's not difficult to find a decent crime novel, but I've found it hard to find crime novels that stay true to the genre but also manage to add something different. Eva Dolan's Long Way Home is one of those rare crime novels that is definitely crime, but is also so much more. When detectives Zigic and Ferreira, of Peterborough's hate crime squad, are called to the case of a man found burnt to death in a shed, they quickly realise that the case is more complicated than it first looks. As they investigate further, they discover communities full of prejudice, and a city still coming to terms with the fact that its make up has completely changed. At its centre, Long Way Home is a murder mystery, but it's far from a straightforward one. Dolan fills her novel with twists and turns, and from the terror-filled beginning keeps her reader guessing as to what's going to happen next, and how everything is linked. The novel is intricately plotted, and sprawling without ever feeling out of control. Part of its charm is its well formed, flawed characters, who are always believable and who therefore make the novel believable. Both Zigic and Ferreira, as well as their colleagues, are great additions to the detective genre and I look forward to seeing them in further novels (I hope). But the best part of Long Way Home is how it is also a novel about immigration and racial tensions, as well as being a crime novel. Dolan deftly shows the difficulties of a city, already struggling in hard economic times, changing and dealing with an influx of people from different countries. It's a nuanced look at how immigrants can suffer, despite their hopes for a better life in England. Dolan also shows how immigration can affect a city's long-term population, without ever scaremongering, and how different waves of immigrants view each other. The underlying tensions are brilliantly presented, and the way they simmer and manifest themselves is great to watch, while also being really true to life. Dolan captures the current mood of the nation really well in a slice of fiction, and does it with more subtlety and accuracy than any of our politicians. 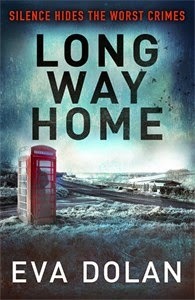 Bringing lots of other elements into a crime novel doesn't hurt Long Way Home in any way, they just enhance it. Dolan's book is still a great murder mystery, but it's also so much more than that for those who want their crime with added layers. Thrilling, surprising and clever, Long Way Home is a must-read for any fans of crime, and is a great read for those who only occasionally dip into the genre. How I got this book: From the publisher, Vintage. This did not affect my review.